TCC Perry Center for Visual & Culinary Arts and Hospitality Management in Norfolk’s NEON District is scheduled to open during the fall semester of 2021. Tidewater Community College will receive $500,000 over the next five years from the Hampton Roads Community Foundation to help build the TCC Perry Center for Visual & Culinary Arts and Hospitality Management in Norfolk’s NEON District. TCC was one of seven recipients of grants from the Hampton Roads Community Foundation, which focused on environmental stewardship and vibrant places in awarding funds. 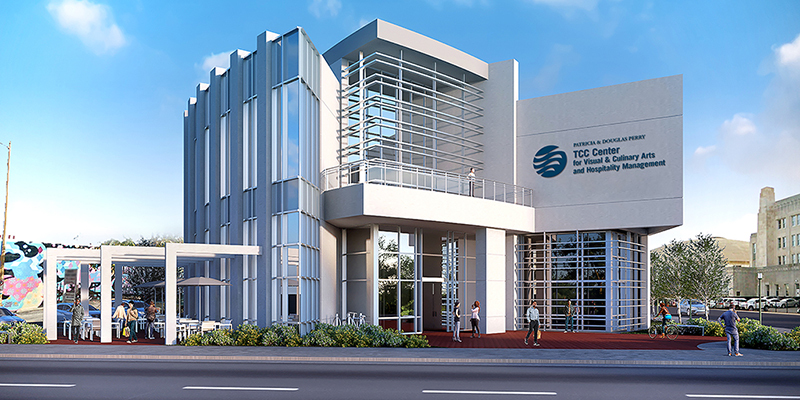 “We’re appreciative of the Hampton Roads Community Foundation’s generosity, which shows its confidence in what promises to be a transformative facility for the City of Norfolk,” said TCC President Gregory T. DeCinque. providing dual-enrollment opportunities for Norfolk high school students and workforce education to residents. The project will be funded by some TCC general funds but mostly by private donations raised through Go Further! TCC’s Campaign for a Competitive Workforce. Norfolk’s Patricia and Douglas Perry are the lead donors in the initiative. “We are hoping to begin construction in early 2020 with an opening date of Fall Semester 2021,” said Matthew Baumgarten, executive director of TCC’s Real Estate Foundation. The City of Norfolk is donating the site of the former Greyhound bus station at the corner of Brambleton and Monticello avenues to the TCC Real Estate Foundation to make way for the new project. For more information about donating to TCC’s Campaign for a Competitive Workforce, contact the college’s Educational Foundation at 757-822-1080 or visit advancement.tcc.edu.